Grin and BEAR "I.T." 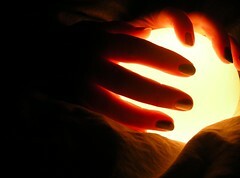 | What do you see in your crystal ball? Currently our district is in the process of technology planning for the next 3 years. As part of the process I made site visits to each of our schools to seek input from our teachers. I shared with them videos as well as the 2010 Horizon Report (2011 just came out!). What technology ideas do you have that would enhance/support your student’s learning IN and OUTSIDE your classroom? What technology ideas do you have that would enhance/support YOUR learning IN and OUTSIDE your classroom? What technology ideas do you have that could help you do a better job at teaching or help you be more productive? What technology ideas do you have that could help our district save money? What do I see in my Educational crystal ball? Above are just a few of the things I see coming to education in the near future. What am I missing? A template of this Google Doc was created and shared with our schools and district technology committee as a way to seek input. I would also ask that you share your ideas if interested! Either use the Google doc or reply to this post….. What should we be considering for the next 3-4 years? This entry was posted in Bear NewZ, Best Practice, Technology Learning. Bookmark the permalink. I agree with what you see in YOUR crystal ball and feel you really hit the nail on the head in terms of what the students need; however, what the mainstream population can handle is an entirely different. ( I guess I am biased as the organization I work for has been doing all 4 of those things for 17 years now and yet is still considered, “out there” by so many. Amazing how PLP’s for all students, 1:1 student computer ratio, student driven inquiry based learning, in a collegial environment is so outside the norm. We also use the hope survey (www.hopesurvey.org) to assess the learning environment. If you are interested in what that is check out our videos at http://www.edvisionsschools.org. These are FANTASTIC resources! You are also right, that the things I highlighted are not the norm in public education. Its exciting that you have experience in these areas and hopefully I can learn from you! I have to wonder… what do districts who have “it” dream about or “see” in their crystal ball?